I have decided to embrace modern culture and document my entire personal experieces on the web in (potentially) full view of the entire world! I feel rather exposed, almost naked. And if I'm quite honest, it's a little arousing! The aim of this blog is to create a light hearted record my experiences of living and working in Antarctica. 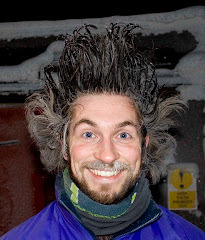 I have been recruited by the British Antarctic Survey to work as an electronics technician / meteorologist at the Halley station (based on the Brunt Ice Shelf). My contract is to spend 15 months from November 2007 until March 2009 living and working in one of the most hostile locations on earth acting as the on-station science rep for the scientists back at HQ in Cambridge. I am often affectionately known within my family as "Monkey". With a beautiful play on words combined with the name of a well known band, I have devised a devilishly and cunningly genius blog title. Ah, my wit sees no limits. "But why Monkey?" I hear you cry. Well, I am a young man with considerable levels of testosterone flowing through my veins. A consequence of this hormonal power coarsing through my system is that I have a slightly hairy disposition. I guess some who know me would say that "slightly" is somewhat of an understatement. I shall be using this blog as a place to record each significant experience I have of my time working for the British Antarctic Survey. This blog starts at a time of 0245 in the morning of Monday 3rd Sept 2007, two days before I begin my contract. I am sitting up desperately trying to record my entire CD collection to MP3 so that I do not have to add copious amounts of CDs to my consignment for shipping to Antarctica. Yes, once again, I am a late developer in the way of modern life. I have never maintained a good library of my music on computer and now I have left it a little bit late to start. I have a long drive back to good ol' Hopton-on-Sea tomorrow so that I can dump a lot of stuff on my poor old mother. I then head to Cambridge to spend a week on my mates sofa before starting the conference. I'm somewhat concerned as to how I am going to fit everything I need to transport into little Teresa*. Yes, I can see this blog becoming somewhat surreal already. Maybe it's something to do with hysteria kicking in from lack of sleep. I'll sign off here, and hopefully we'll have some level of normality in the next entry. *Teresa is my car. Her full name is in fact Whet Teresa. (To drive her provides me with pleasure, hence her name). There's an anagram to the full name, but you'll have to work that out yourselves. Teresa is no more. I had to dump her. The damn rotton MOT ran out, and to pass she would have needed £900 in repairs. A price which is 3x more than the value of the car. So, I decided to put her out of her misery and sell her to a breakers. On the bright side, I made £50...but on the downside, the MOT cost me £50. Zero profit and zero transport. "he just said he was popping out for a bit and that was the last we saw of him - bloody bloke". Seems a tad premature posting now, particularly as we'll see you in November before your big departure, but already a good and interesting insight into your new life. I must take issue with you about your 'acting' but that can wait for another time :-). Keep posting and take good care. Well, I have managed to get thus far, have I surprised you David? I bloody well have surprised myself. Make a splash down south David but not literally. Oh and by the way, less of the "poor old mother", you cheeky sod. Maybe you could use the crevasse rescue technique to escape the mental torment induced by the Cambridge cyclist! Thank you "anonymous", I'll take that advice on board. Unfortunately, I fear it is not as simple as that. My mental torment is a finely balanced intertwined jumble of distress caused by other incidents that have occured in my life. The cyclist incident has only embedded itself amongst it all. As for the other "anonymous"...mum, you're in denial. In denial of what may I ask? I cant believe the lengths people go to miss the Huntsman DO dinner. Just want to wish you good luck on your adventure, sorry we missed you this week at your mums but we were on holiday. Take care, we will keep in touch. I know polar bears dont live in the south, seal clubbing??? Sorry we missed your last evening at the pub, and did not get a chance to say goodbye, your penquin suits looked fantastic. We have just read through your blog and it amused us no end, especially the flight with the 'cinema entertainment' did you have to pay £1.50 for headphones? ps - have you seen any polar bears yet? All the times we shared together, and you dumped me... I am now a tin filled with beans you hard b*stard. Remember me from AWE, we did that first KA Project together :) Wow looks like you are having great fun! So how's things? What's your email addy again?